Ominously opening with a warning that “in Medieval Germany, reality is more horrifying that fantasy,” Darklands keeps its word, whether the horror is a child-gobbling Satanist or just the tedium of digging your scabbed and beaten body out of jail with a spoon. Despite its age, the unique mix of choose-your-own-adventure progression, immersive historical setting and classless builds make Darklands a refreshing and original experience. Set in the 15th century Holy Roman Empire, Darklands covers a large swath of medieval Europe and portrays Greater Germany in the full glory of its grim day-to-day survival, arbitrary law enforcers and superstitious beliefs both rampant and fantastic. 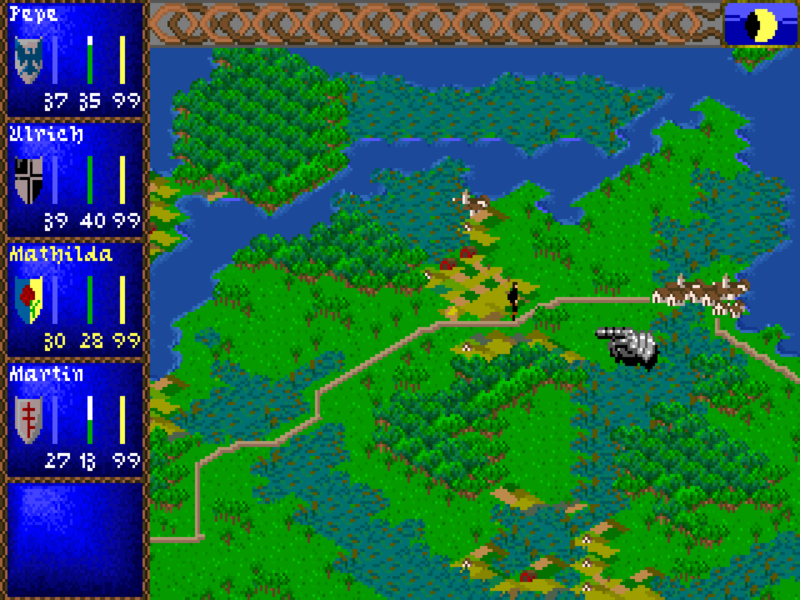 The game world itself is history come to life, thorough and well researched. Dialogue and exploration choices are littered with Germanic linguistics, beautiful pixel art depicts lush medieval scenes with accuracy and detail. With a setting so rich and detailed, it is fitting that Darklands is an open-world RPG, encouraging free exploration from the start while you slowly unravel your ultimate goal: avert an apocalyptic disaster. 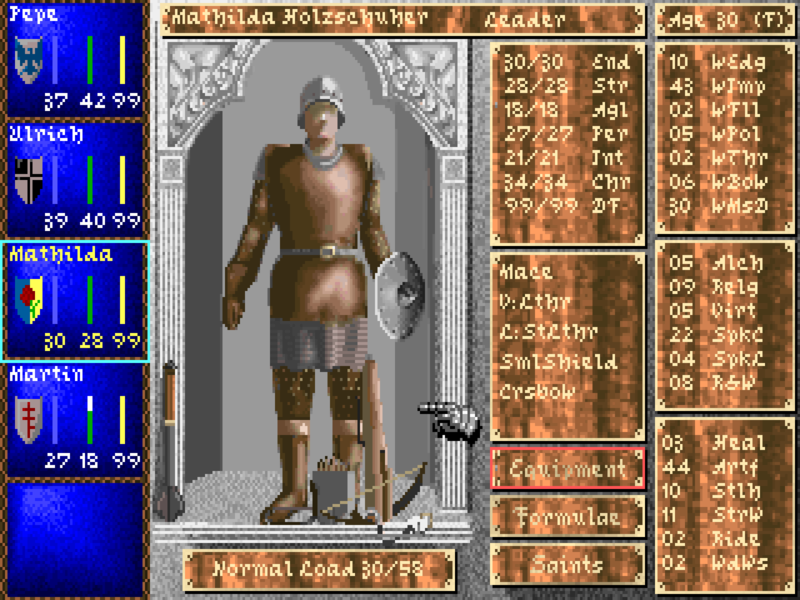 From character creation, the game is admirably committed to the time period, with a system that raises characters from infancy to adulthood with a multitude of options for occupations and backgrounds commonly found in medieval Europe, each adjusting the stats and skills in minor ways. If it’s your dream to role-play a country commoner turned alchemist turned hermit, this is a game for you. In Darklands you’ll never gain experience points or level up. Progression is the result of your actions, successes and failures, increasing and decreasing your attributes in small increments. With a massive variety of skills and stats based off your chosen background, the game creates an interesting party dynamic where characters have a multitude of skills they are good at, instead of the more typical singular focus of classes. Although classless builds are not uncommon in RPGs through the years, it was a rarity at the time, and is still an exciting challenge to build a character without the crutch of a pre-defined class. A diversion from typical fantasy, the game has no Mage character – the closest you’ll get to the arcane arts is a brilliant system of alchemy and divine prayer. It’s a welcome change, as your builds take on qualities not often seen in RPGs, most notably with characters that can call on specific saints to intervene in a myriad of social and hostile situations. The historical accuracy is charming and immersive, all the while being consistently fun to play, proving that once-existing nightmares, beliefs and folklore can be just as entertaining as the usual fantasy genre tropes. Similarly, equipment and loot are wonderfully time period appropriate. It’s refreshing to equip a pike because in the 15th century it was the best way to skewer a wolf with your arm intact, not because it does +25 fire damage. 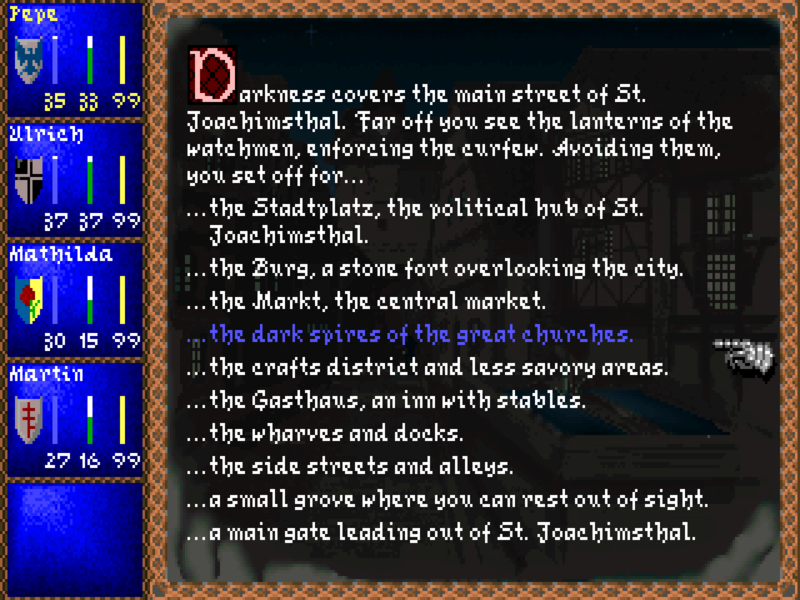 Besides the unique setting and character system, Darklands also shines in its choose-your-own-adventure gameplay. Locations, dialogs and events are all explored primarily through illustrated screens offering multiple choices based on your stats/skills and a surprising amount of free will. These screens are all expertly written, with vivid descriptions that enhance the role-playing aspect of the game. Whether you’re deciding how to enter a town when you don’t have the money to pay the tax, deal with an unwelcome bandit visit in the forest, or discuss a loan with a shrewd banker, the game often allows for multiple outcomes and consequences, many of which do not end well. Darklands is as challenging as it is rewarding, and your choices inevitably lead into undesirable scenarios such as crawling through sewers to escape a landscape of horrors, or surrendering against a vicious pack of creatures only to see one of your companions devoured as a penalty. 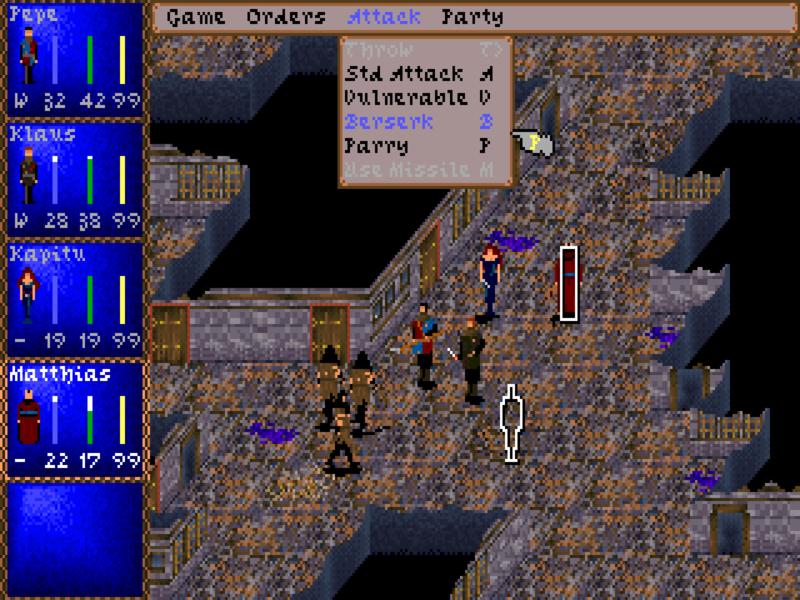 Interrupting your explorations are fast-paced isometric battles, fought through a real-time with pause combat – both innovative concepts at the time. These are usually prefaced with an opportunity to put some divine power on your side or toss an alchemical potion into the fray for a chance to escape. Without the right equipment these encounters can be brutal, leading to bandits robbing you of everything but a few pfennigs hidden in your boot. The game doesn’t look very historically accurate, looks like typical medieval fantasy with leather jerkins, hoods everywhere….’broadswords’ pseudo romanesque stone buildings. Mind you at least the citizens aren’t dressed in burlap sacks and are actually wearing clothing that people would actually dare wear in public like some ‘historical’ games…it just looks like Daggerfall with about as many ‘historical’ elements.